Biting parrots are far more common than you may think. In fact, all pet birds bite. While this is not to say that all birds are aggressive, it should serve as fair warning to anyone who's interested in owning a parrot or another type of pet bird. Sooner or later, you're likely to get bitten and it will be painful. Just because a bird bites you doesn't mean that the bird is mean, aggressive, or isn't bonded to you. Parrots, as hookbills, use their beaks for a variety of functions: preening, eating, climbing, and playing. Parrots often use their beaks in the place of a hand to grab onto toys, food, perches, and sometimes their owners. If your bird is normally good-natured, you may need to evaluate whether or not your parrot is really biting you or is simply using its beak in a normal, healthy fashion. Another possibility is that your bird could be biting you out of fear. Even parrots that were hand fed as babies can develop a fear of humans if they are not properly socialized on a consistent basis. If your bird came into your life as an adult, there are any number of factors it may have come into contact with that can cause fear biting. Even well-socialized birds that are completely comfortable with humans can become frightened of something and bite their owner out of impulse. Learning how to earn your bird's trust can help quell your bird's fears and save you a few sore fingertips. If you are able to determine that your parrot is not playing, trying to climb, attempting to preen you, or isn't simply afraid, then aggression may well be at the root of your bird's biting. 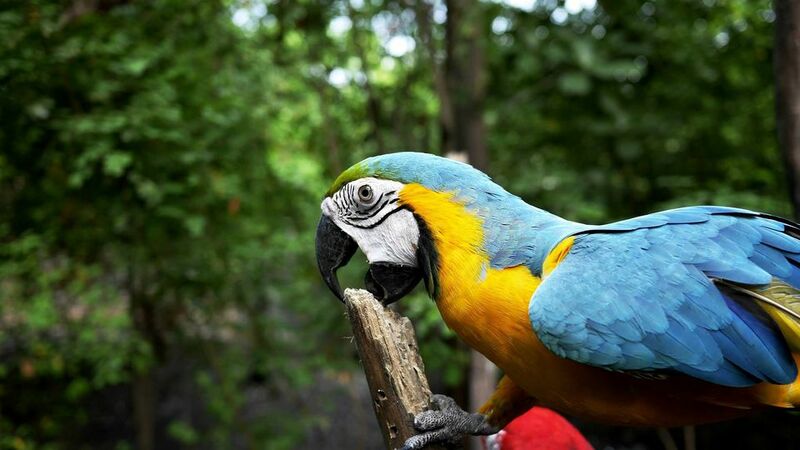 Aggression in parrots can be a serious problem, leading to unhappy birds and even unhappier owners. Causes of aggression in parrots include territoriality, hormonal fluxes during adolescence or breeding season, stress, lack of mental stimulation, and dominance issues, to name a few. Take steps to eliminate any obvious factors that may contribute to your bird's aggression. Check the bird's environment for things that might cause discomfort. Is the cage near a drafty window? Do you need to adjust your cage cleaning schedule so that your bird's home stays clean and comfortable? Are there other pets in the home that could be causing your bird stress? Make adjustments as necessary and monitor your bird's response. Causes of aggressive biting can sometimes be tricky to identify, so it's always a good idea to schedule an appointment with an avian veterinarian to rule out any health issues that may contribute to your bird's undesirable behavior. Handling and taming aggressive parrots: Not every parrot owner is a natural-born bird trainer, but just about anybody can bribe a bird into being handleable with patience and effort. Move to a neutral location, avoid yelling, build trust, focus on repetition, and come with treats. Correcting bad behavior in birds: Birds are very sensitive creatures that interpret our actions very differently than more traditional pets like cats and dogs. This can lead to frustration and miscommunication between the bird and owner, which often only exacerbates existing behavior problems. Successfully rehabilitating a bird with behavior problems requires some knowledge of avian psychology, as well a calm, expressive voice that provides consistent messaging. If you want a pet bird that you can handle and interact with, you will eventually get bitten at some point. The key to dealing with bites is to monitor your bird's behavior patterns and provide consistent training in an effort to pinpoint the cause of the undesirable behavior and fix it. Even in temporary bouts of biting behavior such as the "bluffing" phenomenon, it's important to stick to a set training schedule so that you can disrupt the potential onset of a pattern of behavioral issues. Failure to do so could cost you your relationship with your bird. While you're managing your biting bird, be cautious. Bites aren't only painful, but they can also be severe. While rare, parrot owners have lost eyes, fingers, and toes to their pet birds, while others have sustained traumatic injuries to their lips, ears, and noses. Large parrots have very powerful beaks, and owners must realize that even sweet, tame pets can cause these sorts of severe injuries in the blink of an eye if they get frightened or otherwise upset. These situations can be particularly tragic if kids are involved, so bird lovers with little ones at home should be particularly careful about choosing a parrot species that will make a good pet bird for children. Why Is Your Pet Bird Screaming?